Origin: South America: Amazon River basin. Tank setup: Planted tank with some open swimming space. Compatibility: Peaceful community fish, keep with peaceful tankmates. Water chemistry: Soft and acidic preferred, i.e. 'blackwater' conditions. Feeding: Omnivorous: Flake, granular foods, small live or frozen foods. Sexing: Females are larger and have a smaller, rounded dorsal fin. Males have a longer and more pointed dorsal fin. Breeding: Egg scatterer, the eggs should hatch in about 30 hours and the fry should be free-swimming in about 5-6 days. 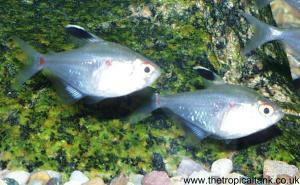 This species is considered difficult to spawn, and there are few cases of aquarium breeding. Comments: An attractive pinky-coloured tetra named for the bright red spot on its body. It should mix well with other larger tetras such as the Black Widow tetra, which will make an interesting colour contrast.